The Conservatives in Mid-Bedfordshire have selected a candidate to replace controversial MP Jonathan Sayeed. Mr Sayeed resigned as an MP on health grounds weeks after surviving a deselection attempt by party members. 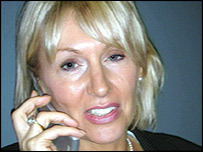 The new candidate, businesswoman Nadine Dorries, said she would move to the constituency immediately. Mr Sayeed was suspended from the House of Commons for two weeks in February this year over claims that he profited from tours of Parliament. Ms Dorries, 47, a former nurse, has previously worked as an adviser to Shadow Chancellor Oliver Letwin.